Once owned by Thomas Jefferson this beautiful 215-foot tall Natural Bridge is a limestone gorge carved out by Cedar Creek. Much more than only a bridge, Virginia’s youngest state park is a natural wonderland of quiet forests, rolling meadows, and views of the surrounding mountains and James River Valley. Six miles of hiking trails offer access to the park, including Cedar Creek Trail which leads from the bridge to the Monacan Indian Village and Lace Falls with an impressive 30-foot cascade. Living history programs demonstrate how earlier inhabitants once used area resources for survival. Begin at the visitor center where you will find exhibits and a gift shop. Jefferson built a two-room log cabin near the bridge, with one room reserved for guests thus beginning its long history as a tourist destination. Many famous guests visited Jefferson at Natural Bridge to view the geological marvel including John Marshall, James Monroe, Henry Clay, Sam Houston, and Martin Van Buren. 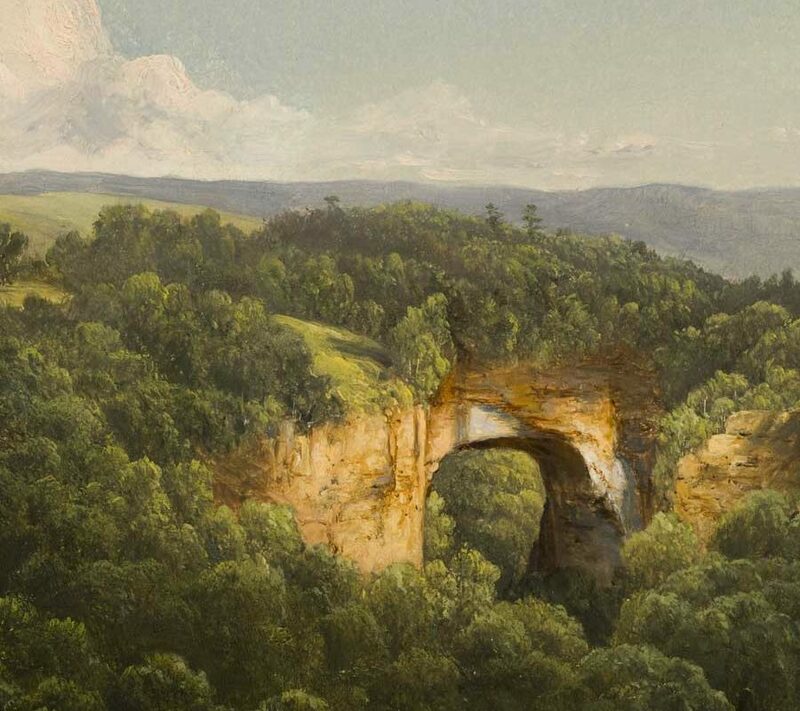 After Jefferson’s death, Natural Bridge continued to evolve as a major tourist attraction becoming known as one of the seven natural wonders of the modern world. Vacationing guests from all over the world took day trips from Natural Bridge Station on horseback or horse-drawn carriages to view the magnificent bridge formation and explore the beautiful countryside. The Natural Bridge remained under private ownership until 2016 when it was acquired by the Commonwealth of Virginia as a state park. The historic and scenic location is now preserved for posterity and remains open to the public just as Thomas Jefferson had desired.